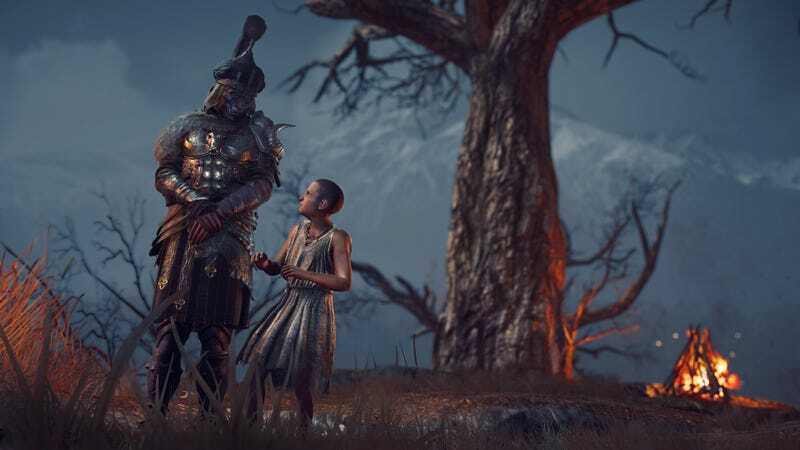 The comically large map of Assassin’s Creed Odyssey, which players can spend well over 100 hours exploring without doing all of its quests and clearing all of its caves and forts, won’t expand outward with the game’s first expansion. That’s a change from how the series has handled downloadable add-ons in in the past. Freedom Cry, Dead Kings, and Curse of the Pharaohs—to name a few of the multiple paid expansions sold for recent Assassin’s Creed games—all added new territory beyond the default map of their game. Legacy of the First Blade, the first expansion for October’s Odyssey, is instead set on the main game’s map, a rep for the game’s publisher, Ubisoft, told Kotaku. They were not able to confirm if the game does or doesn’t have new interiors. This doesn’t mean Ubisoft is skimping on the expansion, which they’re still charging $25 bucks for, or $40 if you go for both of the game’s expansions in a season pass. There appears to be plenty new in Legacy of the First Blade, which tells a story of the Odyssey protagonist’s encounter with the proto-Assassin Darius, the first wielder of the series’ iconic hidden blade. A trailer for the expansion shows new characters, new cutscenes and new elements like a ship that appears to have a flamethrower on it. As with Origins’ expansions, players will need to be a certain level to access the content. The Ubisoft rep told Kotaku that players will have to be level 28 or higher and have completed a questline related to the island of Naxos in the game’s seventh (of nine) main chapters. Legacy of the First Blade’s first episodic chapter, Hunted, will go live in Odyssey on Tuesday, December 4, giving all players and the game’s creators a chance to see how this new approach plays out.